It’s oft been said that most Jewish holidays have but three basic components. 1) Our enemies came to destroy us. That holiday, of course, is the upcoming spring festival of Purim, in which we celebrate the 400 B.C. victory of the Jewish people over the evil Royal Vizier Haman in Persia by feasting on his tri-cornered hat. 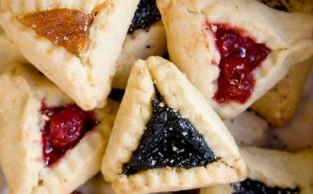 But as delicious as hamantashen (the pastry shaped like Haman's hat) are, it seems kind of a curious custom to celebrate triumph over one’s enemy by scarfing down an article of his clothing, no matter how mouth-watering yummy the clothing may be with a cherry filling. Is it simply a way of “rubbing it in;” that is, consuming Haman’s hat after first stretching his neck? In that case, why just his hat? If we really want to show we’ve kicked the imperial keyster, why not chow down on his raincoat, briefcase, and car keys as well? Perhaps we eat Haman’s hat so heat will escape from the top of his head and reduce his resistance to germs. Then he’ll wind up in bed with the flu suffering as badly as the guy at a Purim party seated next to an overactive 5-year-old with a grogger. But Haman is already dead! Wouldn’t it make better sense to eat the hat off of one of our enemies who’s still alive and kicking, like Almadinejad? Garden of Eden Gummy Serpents --- Yes, we’ve got to get ourselves back to the Garden to vanquish and ingest the original villain who did dirt unto the early folk who were to become the Hebrews. Gummy Serpents come in two varieties --- with legs and legs free. Garden of Eden Gummy Serpents are mostly a sugary treat for children, but if pounding down a few of the squiggly things helps return us all to the Serpent-less State of Nature with The Lady Eve sans vêtements as she’s depicted in the Holy Scriptures, what’s an extra 500 grams of sugar among Jews? The Yul Brynner/Pharaoh Cheese Basket --- Pharaoh is the quintessential villain of the Holy Scriptures, and to most of us actor Yul Brynner is the physical embodiment of that villain. With no disrespect to the late legendary actor, the mouthwatering Yul Brynner/Pharaoh Cheese and Crackers Basket has arrived! The basket is graced with sculpted cheese figures of Yul as Pharaoh in his most memorable action poses from the movie “The Ten Commandments,” including the “Sound the Pursuit” Parmigiana, “God of Moses is a Poor General” Gorgonzola, and “His God is God” Gouda. A plague on all ten of your houses if you don’t enjoy! 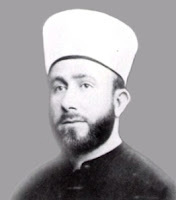 Grand Mufti Marshmallows --- The Grand Mufti of Jerusalem did his utmost to keep Jews from immigrating to Palestine, all the time sporting a headdress that rose so high above his head it looked like it was doing push-ups. 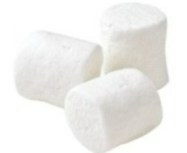 So what could be more appropriate for your snacking pleasure than super fluffy Grand Mufti Marshmallows? Just imagine your satisfaction watching Grand Mufti Marshmallows roasting and crackling over an open campfire! That is, assuming there are any Jews around who know how to make a campfire. Henry Ford Crankshaft Cookies --- Though times have certainly changed at the company he founded, Henry Ford was a cantankerous old coot who was no friend of the Jews. Now eat the cranky crackpot’s crankcase with new Henry Ford Crankcase Cookies, each one shaped in the form of that aforementioned engine component as manufactured for the least successful car ever built by Ford Motor Company, the Edsel. Sure to sell lots better than the Edsel itself! Mel Gibson Pound Cake --- The newest Jewish confection is a large pound cake with reviews of Mel Gibson’s most recent movies chiseled into the top. The New York Times review of the motion picture The Beaver is highlighted at center. Sadly I’ve heard that Mel Gibson Pound Cake is rather dry and tasteless. That’s a shame, but it’s still worse for Mel than for us. He’s got to eat his actual reviews. But You Can't Beat Them! Not a Member of the Tribe? Love this post - and love Hamantashes as well. I wait all year for Purim to come around (poppy are my favorites). Thanks for your comment, Zohar. Although I prefer my Haman's headdress with cherries! I'm in the mood for those gummy serpents. Do they come in sour gummy flavor? Fun post, Perry! Yes, but only in the legless variety! Thanks for your comment, Kathy.